Recently I’ve been asking myself the question, is this what God wants? Does God need our prayer? Does God need us to keep kosher? Does God care if we get a tattoo? Does God need us to worship and praise God? Does God need us to rest on Shabbat? I can come up with many reasons why these things can become personally meaningful, and make me feel more connected to God or more connected to Judaism, but when it comes down to it, I don’t know if God needs these things. Does God, for example, find the sin of eating bacon just as bad as the sin of stealing? Both are commanded in the Torah, yet I cannot believe that God cares more or even equally about the food we eat, and our giving praise, as God must care about how we treat our fellow humans. At my core, my Reform Jewish upbringing prioritizes mitzvot ben adam l’chaveiro. Yet I also know the consequence. Being ethical, and having ethical values, is not enough to make you Jewish generation after generation. Don’t get me wrong, I applaud all ethical people and people who instill those ethics and values into their children as well. But I know that Judaism is more than living ethically. I also know that being ethical is not a compelling reason to continue being part of the Jewish community. So if it isn’t the ethical commandments that “make us Jewish,” what is it? Do YOU have one commandment or one tradition you hold as “without this I wouldn’t be Jewish”? What’s your recipe for Jewish continuity? Also, do you follow THE commandment you think is necessary to be Jewish? I’ve heard people say, “You don’t need to be religious but you should follow the traditions.” I recognize that words like “religious” and “traditional” mean different things to different people, but what does this mean? To me, worship, especially on Shabbat, is part of our tradition, but to many this is a religious act. To me, eating differently, whether Kosher, eco-kosher, or something else, is part of our tradition, but to those who think bacon is too yummy to give up, it is something for “religious people” to do. To me, thanking God for the gifts and blessings in my life and asking God to help me are part of our tradition, but they are also religious. To me, prayer may also be THE thing that keeps me Jewish. Not because other faiths don’t worship this way, not because you have to believe in God to be Jewish, not even because God commands us to pray, and praise God. I think my prayers help me feel connected to a greater world and a greater purpose. I think they help console me in hard times. I think they help me celebrate simchas and see joy in the mundane. This act, which may be the most “religious” of all the examples listed, is the act which I think connects to all the others. Without recognizing the blessing of having food on our plate, and the sacrifice that went into that food, there is no eating purposefully, no matter what kind of food you’ve chosen. Without recognizing the blessings in our life, we miss out on life. Without concentrating on this we might just be good people. This is not the end of the world, but I believe being and connecting with Judaism can give us so much more. You don’t have to do it alone. To connect to Judaism, to God and to mitzvot, which can add meaning to your life, come join us this summer for all the amazing things we do at TRT. And remember, we hold services every Shabbat, even in the summer. To me, prayer is THE thing to connect me to Judaism, not just ethical living. If you think that might be your thing too, come pray with me. What is YOUR commandment? What keeps you Jewish? 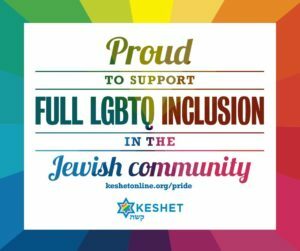 If you want more ideas for connecting Jewishly, I recommend checking out the new website, reformjudaism.org.